Free for Personal, Non-Profit and Journalist Users. 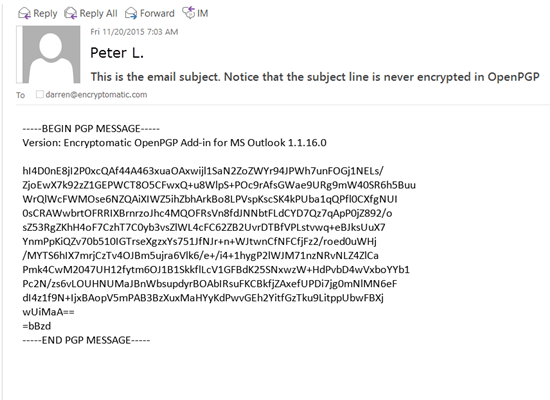 What is Encryptomatic OpenPGP for Outlook? It's an easy to install and use OpenPGP email encryption add-in for Microsoft Office Outlook. If you have been struggling to get OpenPGP email encryption to work in Outlook, then this software is for you! We wanted to use OpenPGP with Outlook in our business, but we quickly learned that the available software tools were either too expensive, too difficult to deploy, or too unstable to use reliably. So being software developers, we built one ourselves! End-to-end e-mail encryption is a crucial tool for protecting your business communications and personal privacy. Journalists use OpenPGP to communicate with sources. Businesses are required by law in the U.S. to encrypt certain types of information before sending by e-mail Lawyers, bankers, and accountants use e-mail encryption to protect their clients. Encryptomatic OpenPGP for Outlook is an add-on that integrates with the Microsoft Outlook menu system to deliver the benefits of OpenPGP e-mail encryption to even non-technical users. After downloading and installing Encryptomatic OpenPGP, open a new e-mail window in Outlook and locate these buttons in the Outlook tool bar. Select the "Encrypt" button, compose your message and "Send" your Outlook e-mail Your message will be encrypted then sent to the recipient. Messages can also be signed by selecting the "Sign" button. After it is encrypted, the message will be obscured while it is in transit. It will look like the message below. Remember that the recipient will need Open PGP software to decrypt the message. If you need an e-mail encryption solution that does not require software on the recipient's device, try our Lockbin.com service, which allows retrieval of the encrypted message online. Lockbin also has a convenient add-in for Microsoft Outlook that can be installed in Outlook along with Encryptomatic OpenPGP. Is Encryptomatic Open PGP Open Source? Encryptomatic Open PGP uses a highly regarded open source cryptolibrary. We are active contributors to the project, both financially and by offering code improvements. While the crypto library is open source, our signed installer package and our Outlook integration code is presently closed source, but may be opened later when this project is substantially complete. PGP, or Pretty Good Privacy, is also known today as GPG. Its a widely used privacy tool that changed the world when it was introduced in 1991 by Phil Zimmermann, who paid a high personal price to bring it to the world. How Open PGP came to be is a fascinating story. Encryptomatic OpenPGP for Outlook is compatible with popular implementations of Open PGP and GPG, including Enigmail. Does Encryptomatic OpenPGP Support Key Servers? How can I share my Public Key? Isn't E-mail Already Encrypted? I heard Gmail was encrypting e-mail. A well managed e-mail server will try to pass messages over an encrypted SSL/TLS connection. While this is always a good idea, it does not happen reliably. Too many email servers still accept unencrypted connections, meaning that your email is vulnerable while in transit. Another issue is whether or not e-mail messages stored on the server are encrypted while at rest. It's safe to assume that in most cases, they are probably not encrypted, which means they are vulnerable to hackers. Plain text e-mails on a server are vulnerable to scanning, tampering, persistent storage and hacking (just as the people at Sony). Encryptomatic OpenPGP is end-to-end e-mail encryption, meaning that your message is completely obscured as it transits the internet and rests on e-mail servers. End-to-end email encryption is a much better plan than hoping your e-mail provider is doing a good job handling your e-mail. 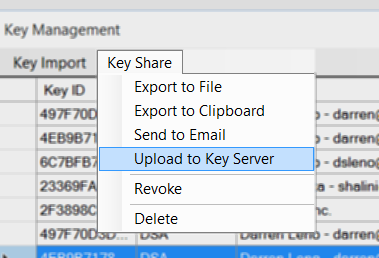 By using OpenPGP tools like Encryptomatic Open PGP for Outlook, your message is encrypted end-to-end, from the sender to the receiver. Even if the email server administrator is lazy and does not use an encrypted connection or disk encryption, the text of your OpenPGP encrypted message remains encrypted anyway. Using OpenPGP means that you are taking control of your privacy, and that you don't have to rely on unknown parties to act responsibly. If you are working to improve the world, we want to support your work. Encryptomatic OpenPGP add-in is free for lots of people, and affordable for everyone else. The capabilities between the free and business licensed software are identical. Use of Encryptomatic OpenPGP on a domain that is used to conduct for-profit business requires a business license. No license is required for personal use, or for use by legal not-for-profit organizations, activists and journalists. Encryptomatic OpenPGP works on all Windows versions of Microsoft Outlook that are still supported by Microsoft Corp. It will work with either 32 or 64 bit versions of Outlook. System administrators are able to customize the user interface, removing any features their users don't need. An .msi file supports silent deployment and silent registration. Detects your operating system and installs either the native 64 or 32-bit version automatically. Contact our sales team for enterprise pricing (more than 250 users). Encryptomatic OpenPGP for Outlook is distributed as a code-signed .EXE executable and a .MSI Windows Installer Package. The executable version will check for required Windows components and offer to download and install any that may be missing. In enterprise environments, a .msi distributable file is available. License activation and silent installation can be accomplished by using the command line parameters specified in the help file. An activation free version is available for enterprise site license customers and for use in some shared environment settings. Encryptomatic Open PGP requires Windows 10/8/7, Microsoft Outlook 2016/2013/2010, both 32 and 64 bit versions. .Net Framework 4 or later, 1 GB RAM, 100 MB disk space, and 1 GB processor. 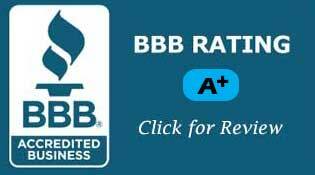 For more information, contact our sales team at +1.651.815.4902 x1 or e-mail sales at encryptomatic.com. For product assistance, please open a help ticket. To remove, run the installer app and choose "Uninstall," or use Windows Add/Remove Programs service. EULA. Microsoft®, Office® and Outlook® are registered marks of Microsoft Corp. Encryptomatic® is a registered mark of Encryptomatic LLC.